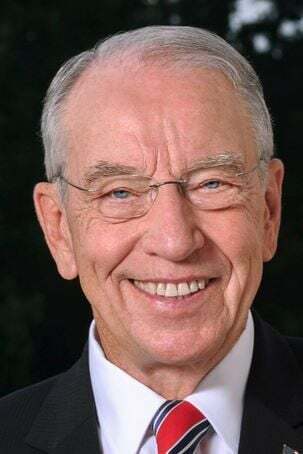 Grassley’s decision comes one day after Feinstein, the top Democrat on the Senate panel, requested a hearing be held “as quickly as possible” with Whitaker and ex-Attorney General Jeff Sessions, who was forced to resign last week. Democrats have questioned whether Whitaker’s appointment is legal or if he would do anything to obstruct special counsel Robert Mueller’s investigation of Russian interference with the 2016 election, a probe Whitaker has criticized. Whitaker, a former U.S. attorney from Ankeny who has long been involved in Iowa’s political circles, was thrust into the national spotlight last week after he was chosen by President Donald Trump to temporarily lead the Justice Department following Sessions’ resignation. Since then, he’s faced criticisms for comments he made denigrating the Russia investigation and about his role as an advisory board member of a company that’s being investigated by the FBI for fraud. Whitaker was back in Iowa for two events on Wednesday, speaking at Des Moines conferences about justice issues, violent crime and opioid abuse. The acting attorney general made no comments regarding the circumstances of his appointment, nor did he take questions from reporters. Instead, Whitaker applauded the federal justice department and the Trump administration for supporting state and local law enforcement agencies, highlighting cases in which the feds worked alongside state and local officials to catch and prosecute senior scams. Earlier in the day during a conference call with Iowa reporters, Grassley dismissed ethical concerns surrounding Whitaker. The 84-year-old senator referenced several face-to-face meetings he’s had with the acting attorney general as evidence of his ability to perform well in the role. Those experiences included working together on the campaign trail twice, going on jogs around Des Moines and eating oatmeal in the senator’s Washington home. “I have full faith in his abilities as acting attorney general,” Grassley said. Grassley added that a formal Senate process to confirm Whitaker in his temporary job would be “stupid,” saying the Senate would need to reconvene anyway once a permanent nominee is selected. That announcement is expected to come from the White House within a few weeks. Also Wednesday, the Justice Department issued a memo saying Whitaker’s appointment was constitutionally correct, a departure from some legal experts who argue otherwise. A legal challenge was filed this week in a Maryland federal court to examine that question. Feinstein wasn't calling for a confirmation hearing. She wanted a hearing about whether this was a legal appointment, which it clearly isn't. It violates a law that Congress passed after Nixon tried to stop investigations into him. Whitaker's appointment may be "temporary" but that could last 200 days or more. Eating oatmeal with Whitaker isn't the same as the Senate exercising its constitutional requirement to oversee the Administrative branch.